Make your way onto the Eastern Freeway and travel towards Ringwood. The Eastern Freeway turns into the Eastlink after Springvale Road. If you have an Eastlink or Citylink pass, continue on the Eastlink Tollway and go through the Mullum Mullum tunnel – make sure to stay in the left lane as the turnoff is straight after the tunnel ends. Turn left after exiting the tunnel towards Ringwood. Turn left onto the Maroondah Highway towards Lilydale. Once past Lilydale, turn right at the Warburton Highway turnoff to explore the Warburton Valley. Check the map below. Public Transport Victoria has regular trains heading to Lilydale Station. From Lilydale Station, catch a Martyrs bus to travel to Warburton. 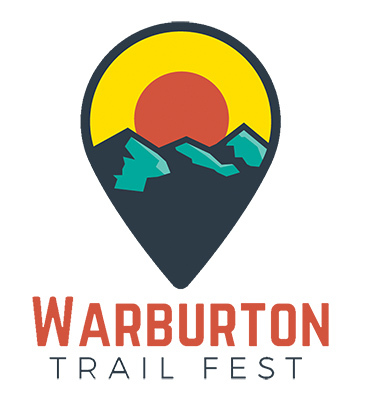 Alternatively you could ride your bike from Lilydale to Warburton on the best rail trail in the state, the Lilydale to Warburton Rail Trail. Please be aware of our local fauna as you drive. Deers, kangaroos, wombats and other local wildlife are especially active at dusk but it's worth keeping an eye out for them at all times during your visit. Turn around point for the 14km Sawmill Grove Run. That's Millgrove township in the valley below. It's in a grove. You'll see it. See what we did there?